Really great we finally got some rain to green things up again and help the Farmers get a start to their new season, and give the wildlife some relief. 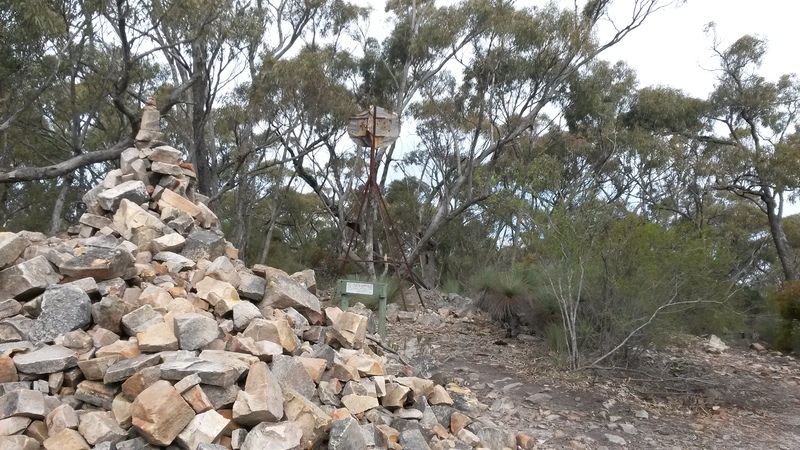 The first summit this time was Mt Bryan vk5/se-001, this time I decided to walk there along the Heysen Trail as a training walk for some of the longer hikes ahead in my season. 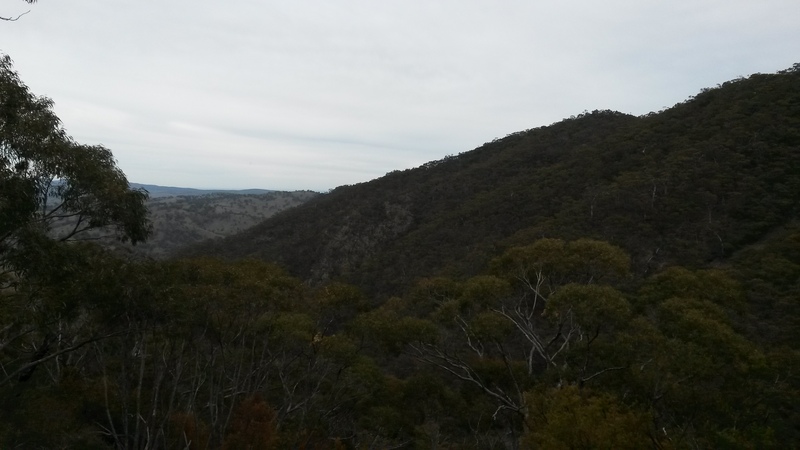 View from the car park about 2.4 km to hike. This is where the pain and puff kicks in. Then it really hurts. 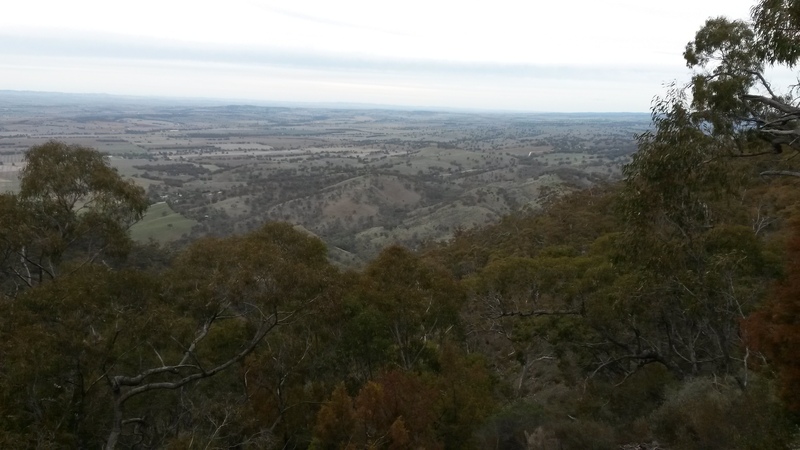 View from the top looking east. 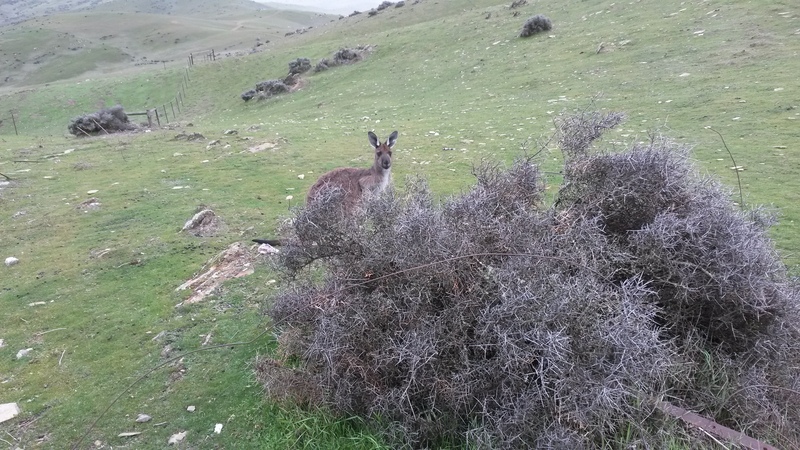 The Wind was kind today up here This old Roo was sleeping behind this bush. My shack for the day on the western side out of the wind. 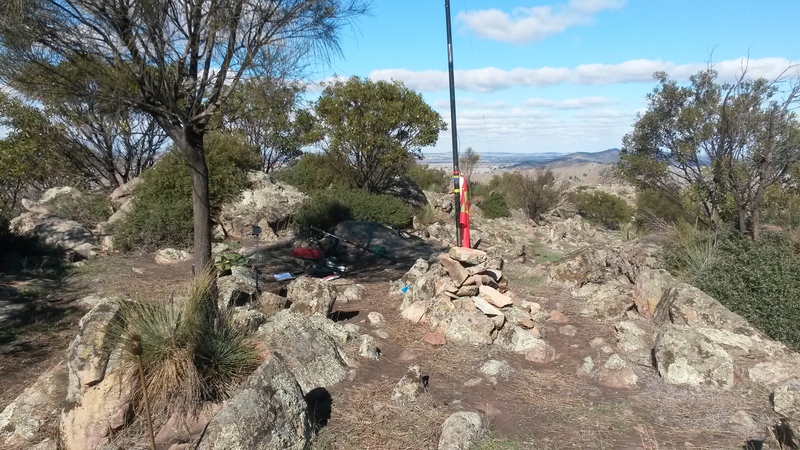 After working the locals on 80m I managed to get 4 contacts qualifying the summit before changing to 40m. 3 Stations on 40m ssb and 8 Stations on 40m cw, it’s really great to have so many cw chasers these days. 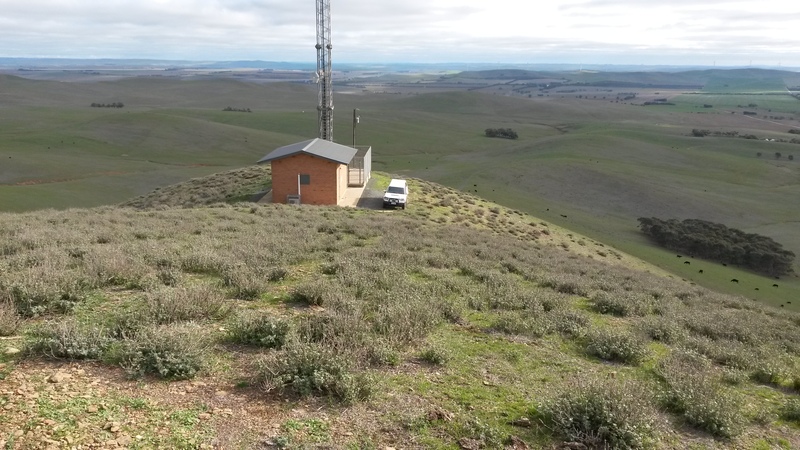 While I was working on cw a hiker came across and spoke to me and was surprised to come across someone sending Morse Code on a hill top. We had a nice chat and I was able to continue working more stations while he was there. 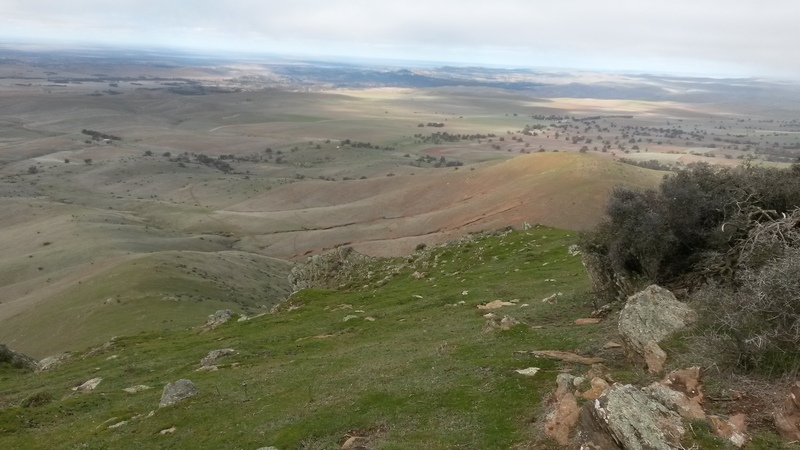 He is doing a hike from Blinman to Cape Jervis the entire length of the Heysen Trail. 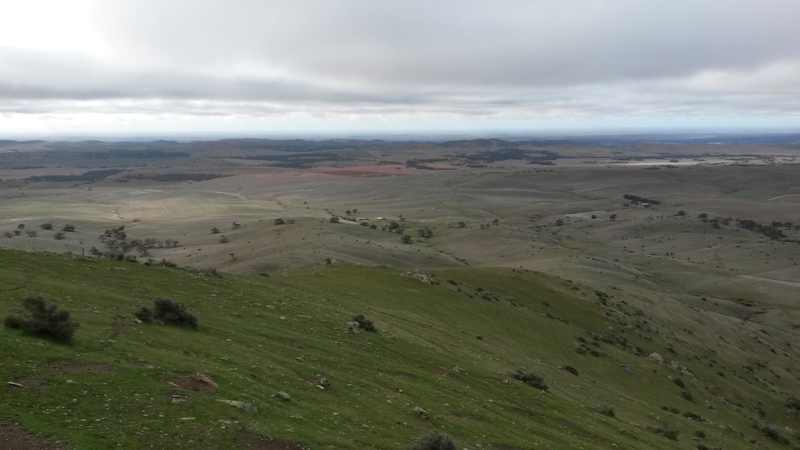 He started in Blinman in May and some of his hike distances every day were by far further than I have ever hiked. 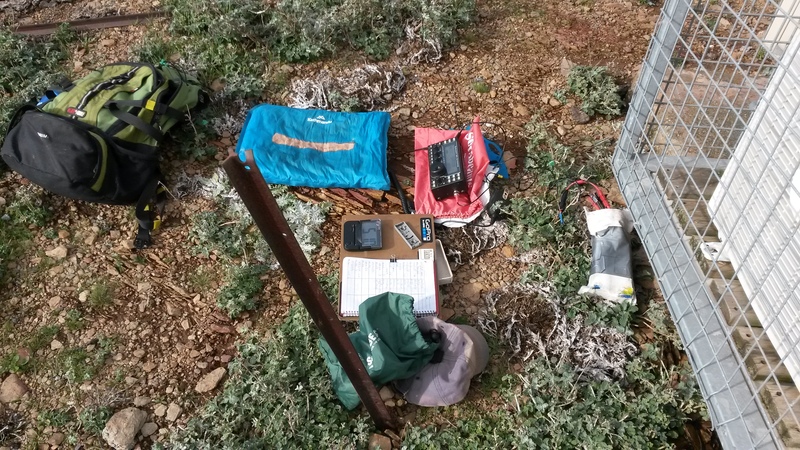 We descended the summit together back to my SOTA transporter, shared my egg and bacon sanger with a cup of coffee before parting company. Great experience to meet such a nice fella with a tough commitment. Leaving Mt Bryan I had plenty of time left in my day out so I called Simon the land owner of Mt Cone to ask permission to get vk5/se-002 off my list for this year. Turning up at the front gate some time after I found the farmer setting up some new fences so permission was good to go. 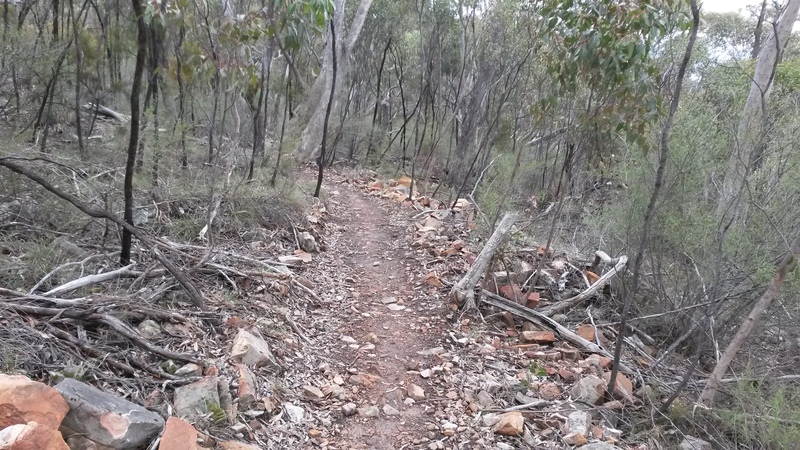 I get to the 4×4 part of the track and find the track is nicely redone with some grey rubble making it a smooth climb to the top. Wind was still a stiff breeze so I set up on the northern side of the hut at the top. 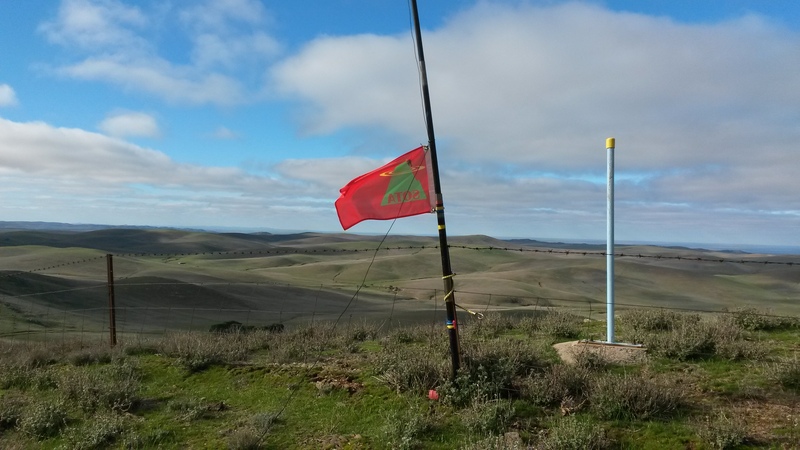 SOTA Flag flying nicely on the trig point. 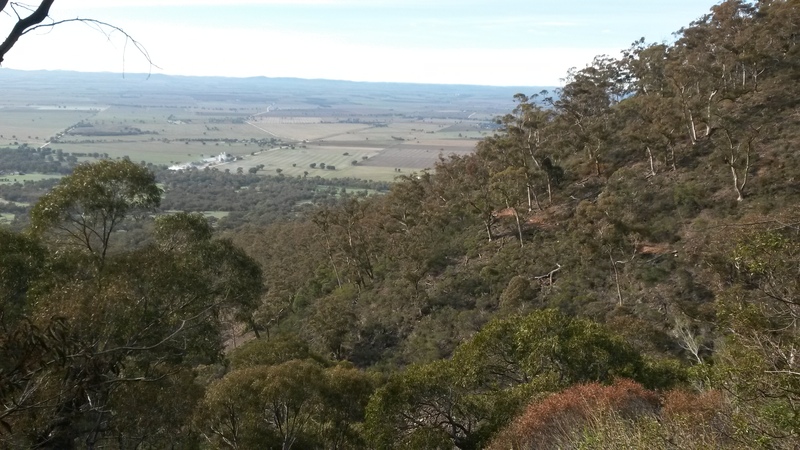 View of Mt Bryan to the north. 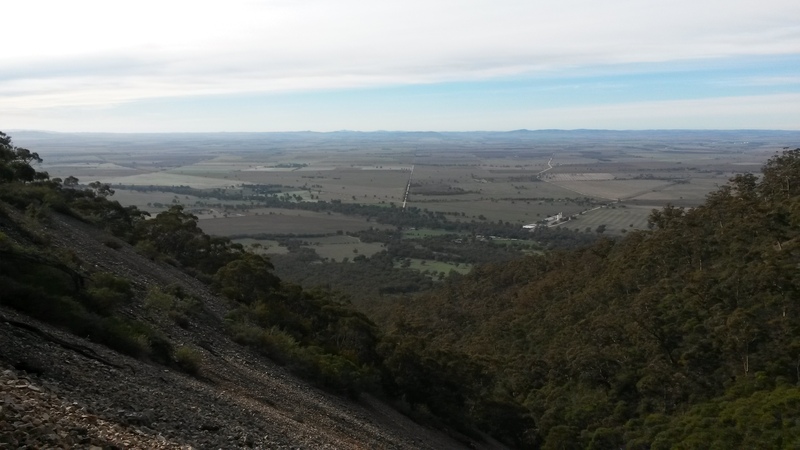 Easy Drive up summit and a 50 m hike. My shack out of the wind. Without a chance to Alert my intentions to activate a second summit Peter VK3PF heard my cq on 40m ssb and put up a spot for me. This time there was some shorter skip on 40m making it possible to work some vk5 stations for a change, good signals to vk2 vk3 vk5 and zl on 40m ssb, vk3 and vk7 on cw. Swapping back to 80m I found Nev VK5WG waiting for me to appear so I worked nearly the whole team of faithful chasers. 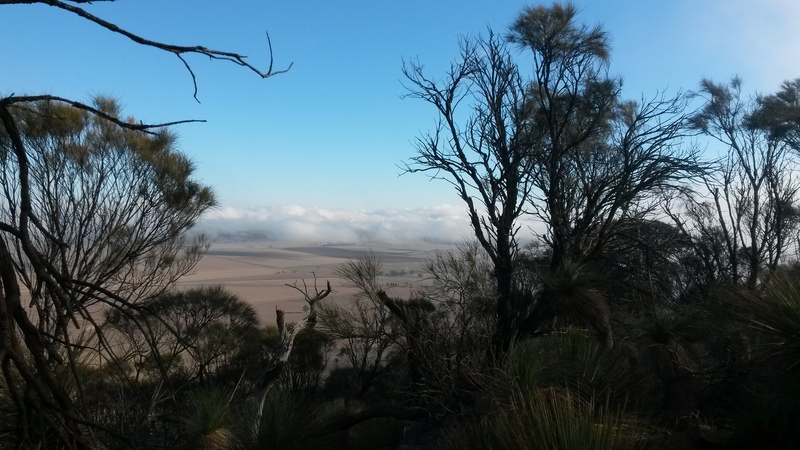 The rain moved on and wind speed was to be low so I decided to go to Mount Remarkable vk5/ne-010 the next day. 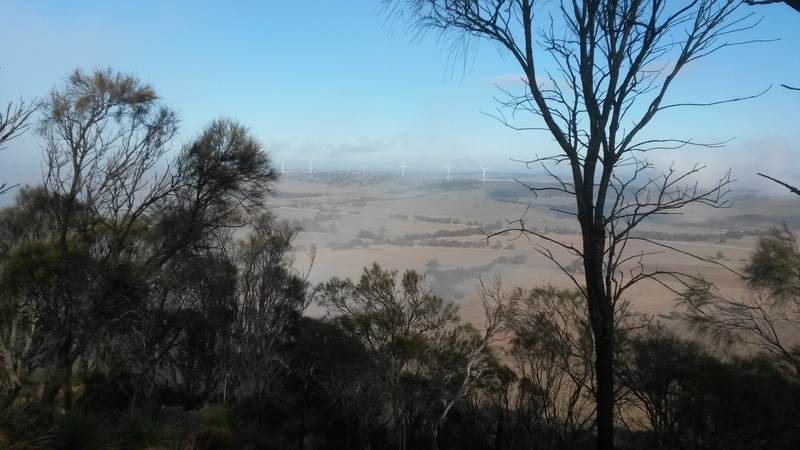 Being a 6.7 km hike up I had to leave before sun up to make the drive to Melrose plus hike up to make the Alert time. Nothing major on the hike up had a couple stops to drink and take photos. 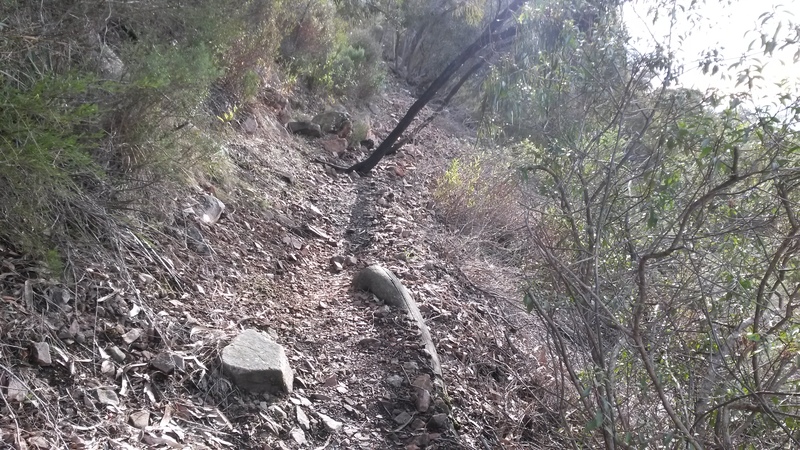 Typical of the old well worn track. On the screed parts its nicely benched. Nice views to the East on the way up. 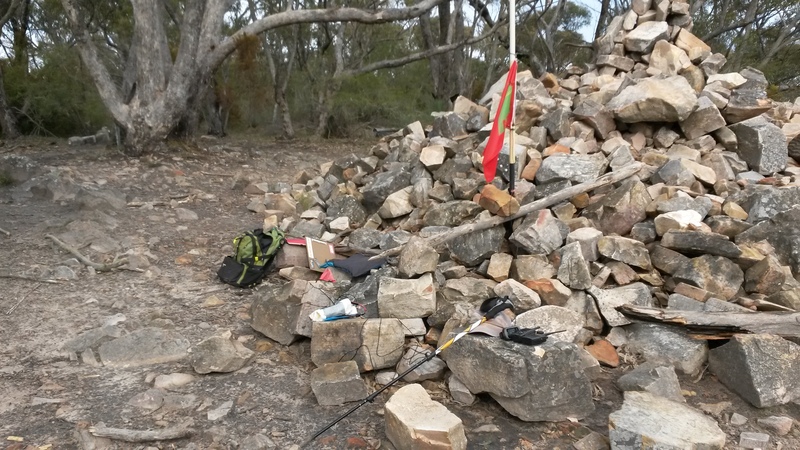 My shack at the top rock pile and the old shot up trig point. View from the top is not good, too many trees making it hard to set up my 80m dipole but it still seems to work laying on the bushes near the ends. Made 3 contacts on 80m ssb but my signal was quite low to start with then I discovered a fault with an alligator clip at the 20m section on the link dipole making the antenna way too short for 80m. Swapping to 40m and a new Spot netted several chasers from vk4 vk3 vk2 on ssb and once again even more cw chasers this time on 40m vk2 vk3 vk6 vk7. A really nice surprise to receive a call from VK5PF John, ZL1TM and finally another S2S with ZL1BYZ on 40m cw. 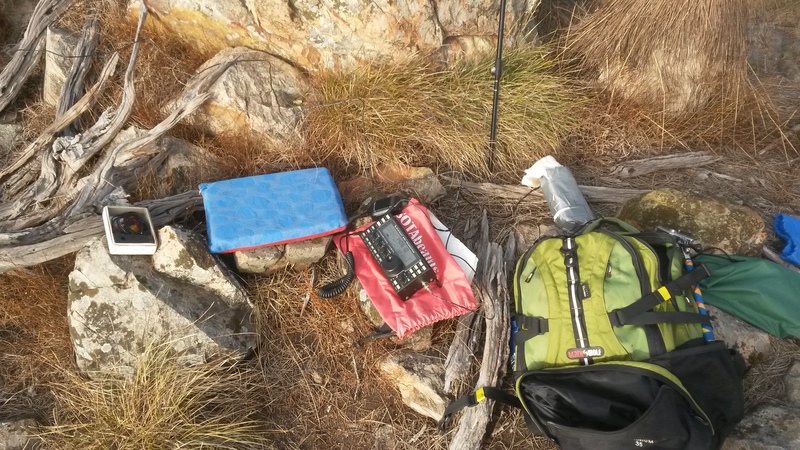 No answer to my cq on 15 or 20m but I was getting cold sitting in the rock pile and packed up to leave. 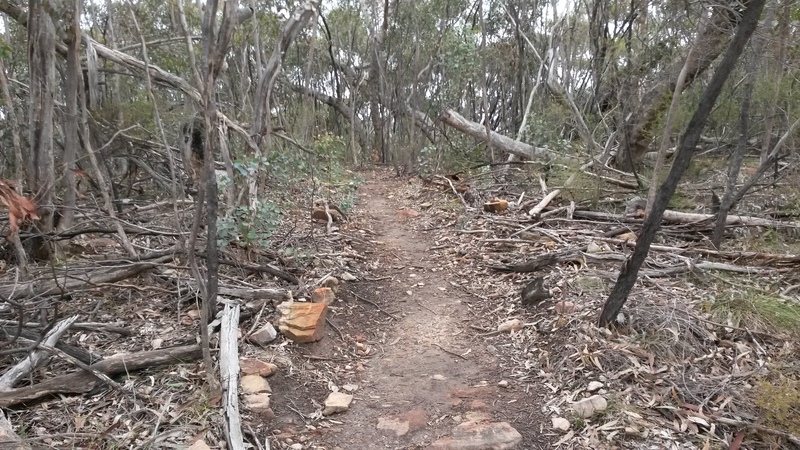 On the way down I decided to try the new walking track called the Southern Loop Trail, claimed distance was 6.5 km but according to my eTrex 30 it was more like 7.8 km by the time I reached the SOTA transporter. Had a senior moment at the 3 km mark, I forgot to pick up my hiking pole when I stopped for a drink and resumed my hike without it. 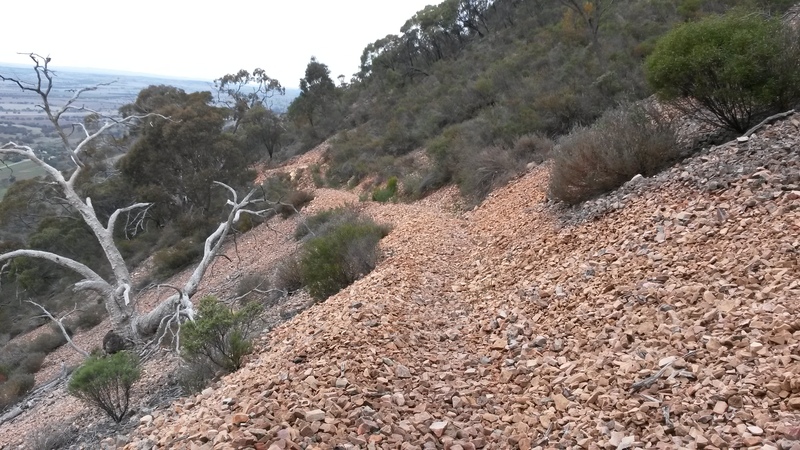 I realised after a km or more that I had forgotten it and I had to back track and retrieve it which gave me an opportunity to see how hard it would be to ascend to the summit on this path. 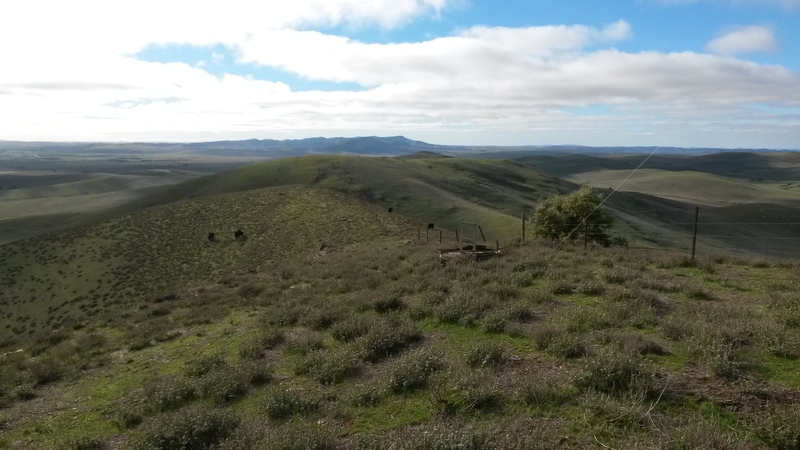 It has great views from the South end of the mountain and you can see as far south to the hills on the northern end of the Clare area. I could easily spot the Grain Silo at Gulnare about 100km to the South. This is typical of the Southern part of the trail an easier hike along the ridge top before you start to descend on the eastern side of the Mountain. 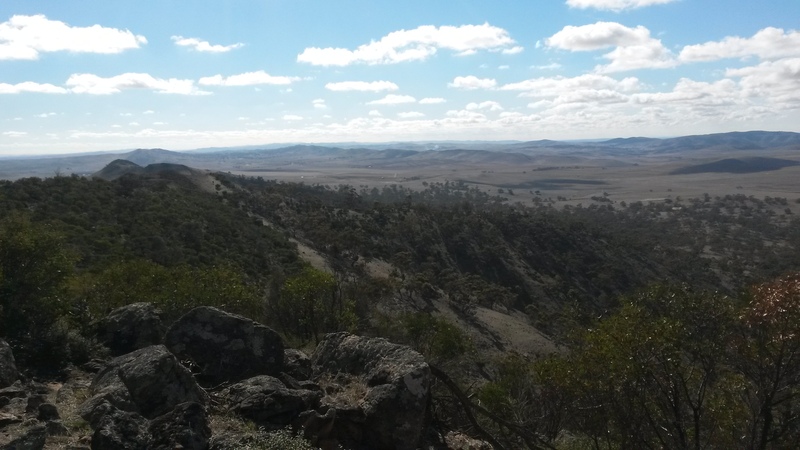 Great views to the South as I start to descend more rapidly now. 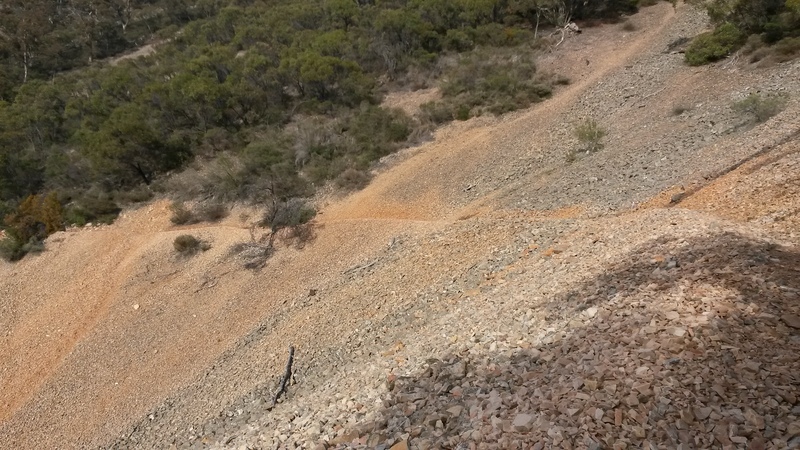 Some of the lower screed benched trail still at a reasonable height on the side of the mountain. 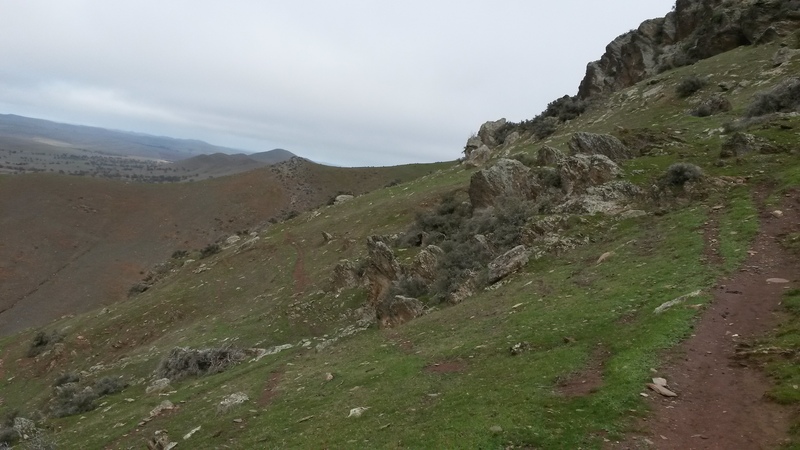 Well I made it back to the SOTA transporter in reasonable condition a bit foot sore and hungry, it was 14.30 local time and I left at 08.30 am on the hike. 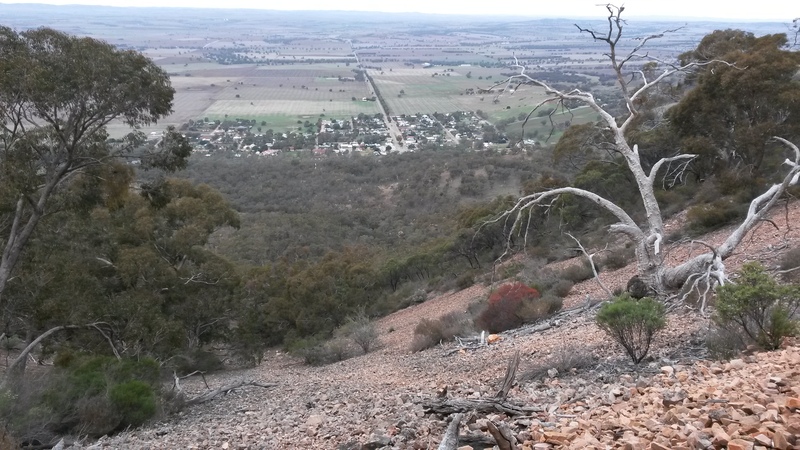 The senior moment cost me more than 2 km extra hike so by the time I had finished the eTrex 30 was showing 16.5 km on the trip meter, 6.7 km was the hike up distance. Taking into account my back track to get my hiking pole, my guess would be it’s more like 7.5 km distance on the Southern Trail. 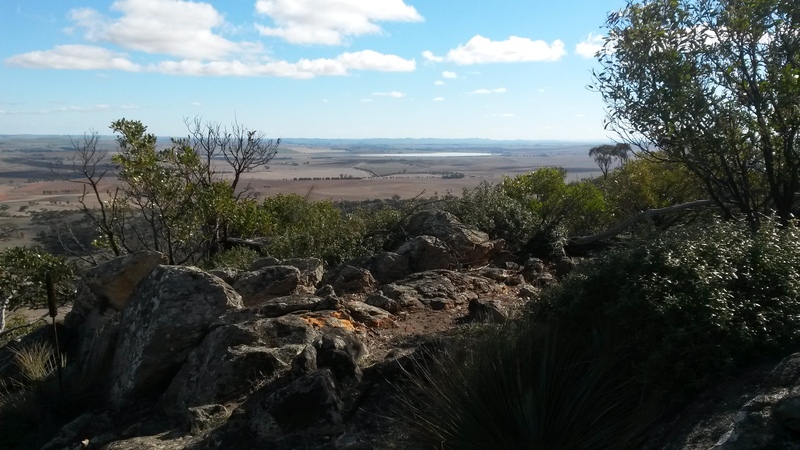 Great day out of adventure, discovering new trails and some great SOTA in the mix. Thanks to all the chasers and thanks for reading my Blog. My drive to Lagoon Hill was a very foggy trip in the SOTA transporter, and I missed a turn off at one of the back roads on the way there. No rush as I had plenty of time it was just getting daylight when I reached the farm gate to enter the summit property. Quick coffee and snack before starting my hike, off I set on this ankle burner. On the way up made some contacts with the vx8 hand held rig via vk5rlh repeater. 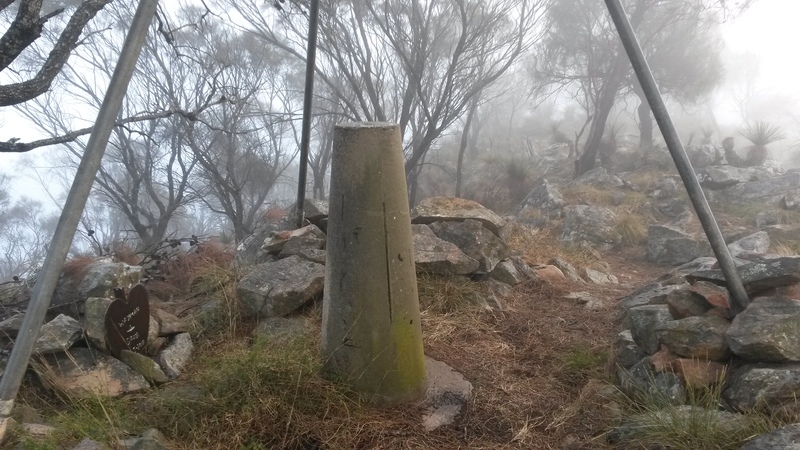 Its about 40 minutes of pain and a very rocky assent to the top but now I have been there a few times the slog is getting easier. Completely fogged in on the top with very wet dripping trees and bush left me a bit wet and cold but once I got the wind jacket on I was comfortable setting up. 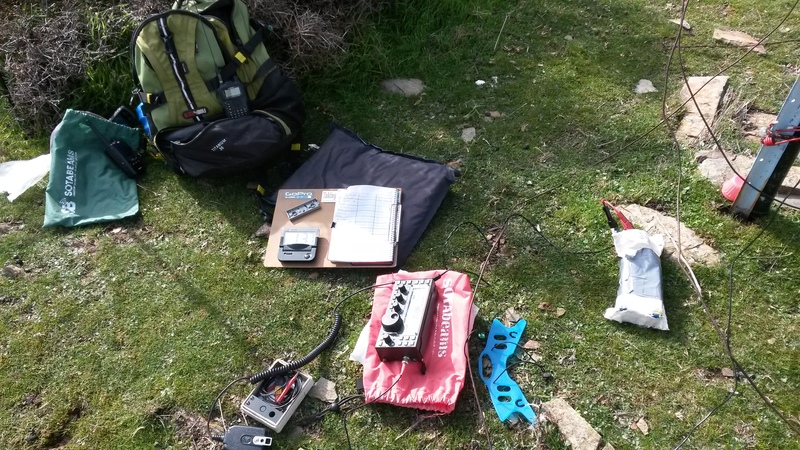 This activation was a bit different as I was hoping to work JP1QEC who was on a summit in Japan, so I set up the high band link dipole first to try my luck with Mot. Checking the Spots on my phone I saw Mot was already working on 15m cw so I got in line once I found him on the band. We made the S2S swap with low signal reports but made the QSO none the less. I noticed when checking my phone ZL1BYZ was on 17m cw as well so I quickly swapped the links in my dipole and worked John for another S2S and a stronger signal than Mot on 15m. Then another nice DX surprise from K0RS on 17m as well . Called CQ on 20m for a while but got no answer before I started setting up the other link dipole to work the VK chasers on 80/40m. 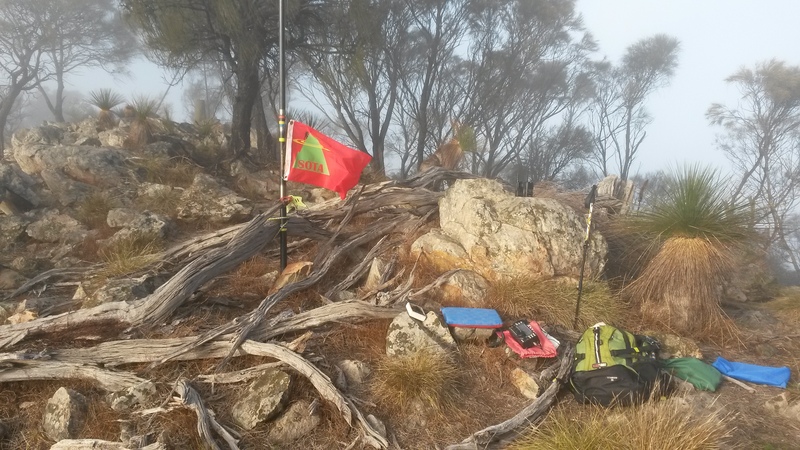 Stumbling through the slippery rocks setting up the 80m extensions was a challenge on this summit but in the end I qualified the summit with VK5WG and VK5IS on 80m and VK3XDM, VK3EQ S2S from vk3. After UTC roll over VK3XDM and VK3EQ again S2S on 40m before all the faithful group of chasers called in on ssb and cw with another S2S with ZL1BYZ on 40m cw this time. Fog cleared it was a very pleasant mornings SOTA for sure. Packed up and headed to Tothill Range. 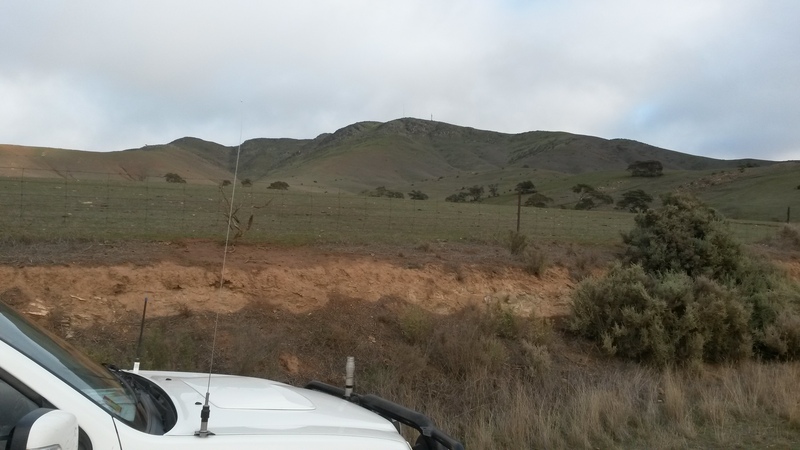 Tothill Range is a much easier hike probably 1.5 km from the ute gradually gaining height from the start. This time I shot some Go Pro for the land owner as they are quite elderly now and don’t think they will ever climb the hill again. Made a small video showing the views, my station set up and making a few ssb and cw qso’s just to give them a better idea of what SOTA is about. 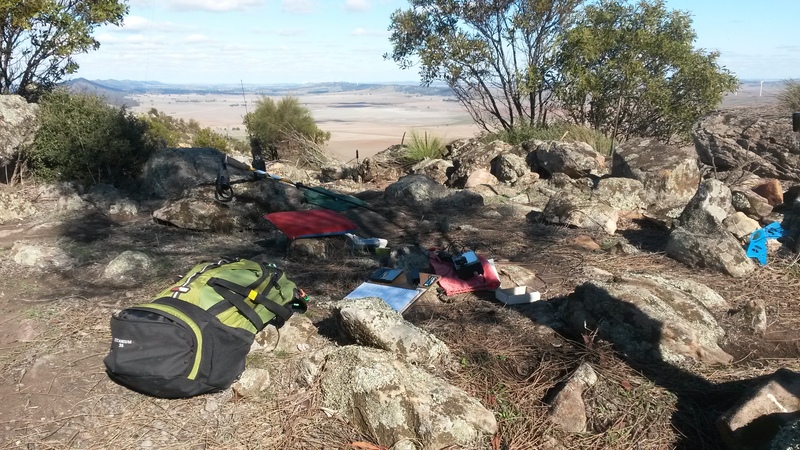 My station on Tothill Range. 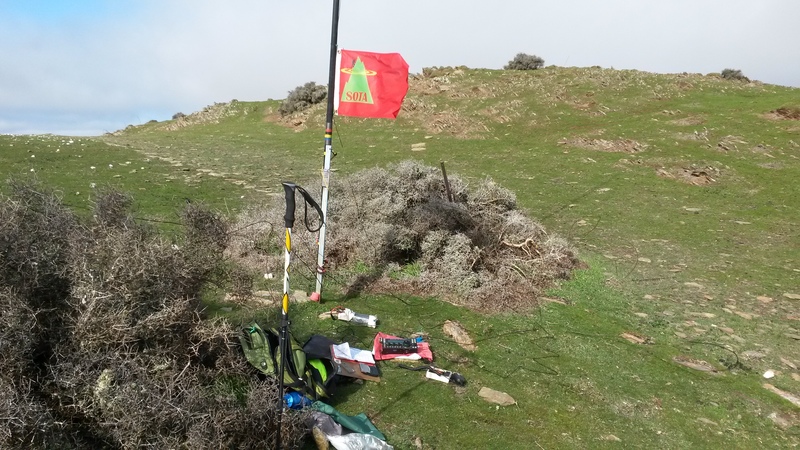 I worked only 40m ssb and cw to start but Adrian VK5FANA Roger VK5WE then Nev VK5WG came on 80m near the end of the activation. Lots of QSB on 40m ssb this time of the day I made a few repeats on the signal reports but got it qualified with 12 QSO’s. 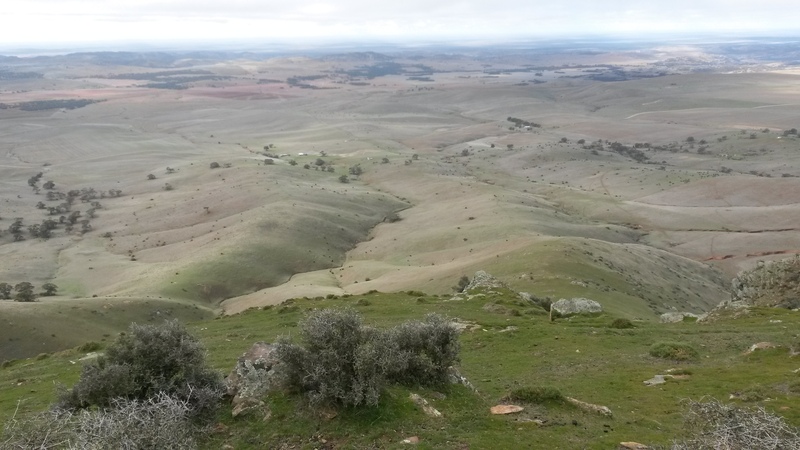 Great Day out on some local summits very dry and we surely need lots of rain so I hope that happens soon. Thanks to the land owners and chasers.